The weapon you're looking at is the prototype of a new BERETTA assault rifle which first production models are purported to be launched on the international Military/LE market some times late next year, or by the beginning 2007, by then something should appear on the specialized press worldwide, while the Italian military is purported to adopt this weapon only along with the SOLDATO FUTURO system (see it at: http://www.securityarms.com/20010315/galleryfiles/2900/2957.htm ). The commercial name of the weapon will be RX4-STORM, and yes, if you're wondering, it will be the third (or fourth) entry in the "X4-STORM" Beretta weapons system, which is already composed by the PX4-STORM selfloading pistol and CX4-STORM semi-automatic carbine, both available in .9x19mm-Luger/Parabellum/NATO, .40-S&W, .9x21mm-IMI, and .45-ACP. Another entry in the system, which might as well appear before this assault rifle, will be a CX4-based multicaliber submachinegun, that'll replace the PM12-S2 and similar SMGs in Italian military and police services, and ultimately in Beretta production (it will cost much more than the PM-12, which is still selling well on the international market; by myself, I've seen in a recent news reportage from Iraq, an US Marine guarding prisoners armed with what I've clearly recognized as a BERETTA PM12-S2 submachinegun). You'll notice differences between this prototype and the one that I've posted in the SOLDATO FUTURO system report. In fact, the rifle that's going to be the RX4-STORM is a major improvement. First of all, it abandons the (yet tried and true) AK47-based working system of the currently issued AR-70/90 Italian military service rifle for a yet undisclosed new working system, that some assume to be HK G36-based. For Italian military service, it will be equipped with the Target Designation System as portrayed in the picture and described in my reportage about the SOLDATO FUTURO system, while on the international market, it will be equippable with any kind of NATO standard optic (including the most notorious "red-dots" as AIMPOINT from Sweden and HAKKO from Japan, and any other imaginable: all ELCANs, the TRIJICON ACOG and any other US-made electronic sight, EO-TECH holo-sights, the British SUSAT, and even the German HENSOLDT optics designed for the HK G36). As for the underbarrel-slung grenade launcher, it will be proprietary, and it will much probably be completely integrated in the gun (non-detachable, but the rifle should be available without the launcher on request, and for the export Military/LE market). This because the grenade launcher, in the Italian service version, will be integrated with the electronic aiming systems of the SOLDATO FUTURO project. As I've said in my reportage about it, the SOLDATO FUTURO Aiming Systems will be the most technologically advanced and versatile on the world; yet today, even on prototype stage, them performe better than the ones available on the market for the FN F2000 Belgian-made modular rifle, and even surpass the ones programmed on the American OBJECTIVE LAND WARRIOR/FORCE WARRIOR and British FIST projects. 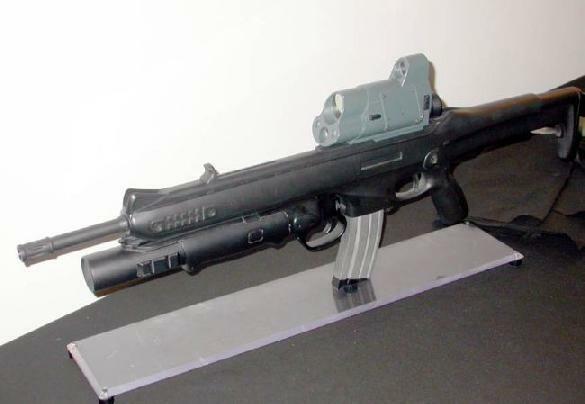 As for the export version (the SOLDATO FUTURO system is not purported to be made available on the foreign Military/LE/Governmental markets, even if it's to be made completely compatible with similar NATO programs), the RX4-STORM rifle will be available with or without the proprietary integrated grenade launcher, but even without it, the RX4-STORM should be able to fit other grenade launchers such as the M-203. I haven't much more to say about this weapon, by now. This is the only picture yet available. More details to come as the weapon is unveiled!